In 3-quart saucepan, heat 2 quarts water to boiling. Break noodles in half and pull apart slightly; drop into boiling water. Cook uncovered 1 minute; drain. Rinse with cold water; drain. In small bowl, beat peanut butter, soy sauce, gingerroot and crushed red pepper with wire whisk until smooth. Gradually beat in broth. 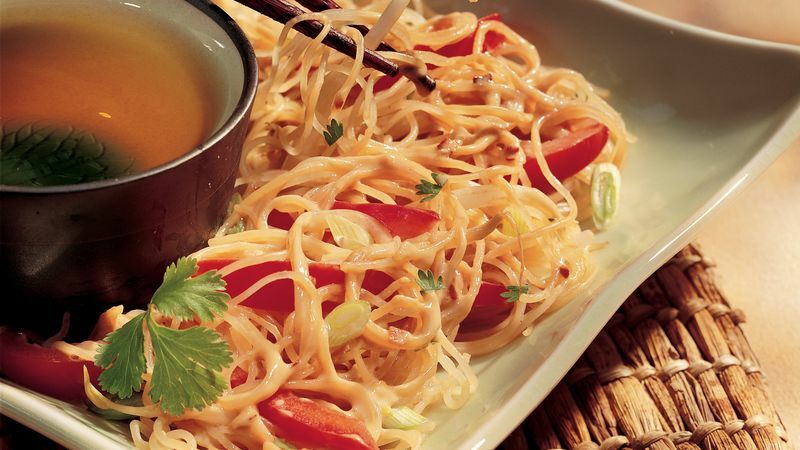 Place noodles in large bowl. Add peanut butter mixture, carrots, bell pepper and onions; toss. Sprinkle with cilantro. Rice stick noodles are white and translucent and have a very delicate flavor and texture, making them perfect for soaking up whatever flavors they're mixed with. Look for them in the Asian-foods section of the supermarket.